I’m cramming a lot of events and appearances into this month before I realize I should probably do things like figure out how our carseat works and come up with a “birth plan” (just kidding: the “plan” is just for the baby to come out in some relatively uncomplicated fashion.) If you’d like to see/hear me or if you’re just curious to hear about some great events going on around the city, check out these tasty nuggets! I will be on The Afternoon Shift with Steve Edwards sometime around 2:40 to 3 p.m. this Wednesday talking about something entertaining and intriguing, trying not to say “Yeah!” before beginning every sentence, which, according to my mom, I do a lot. 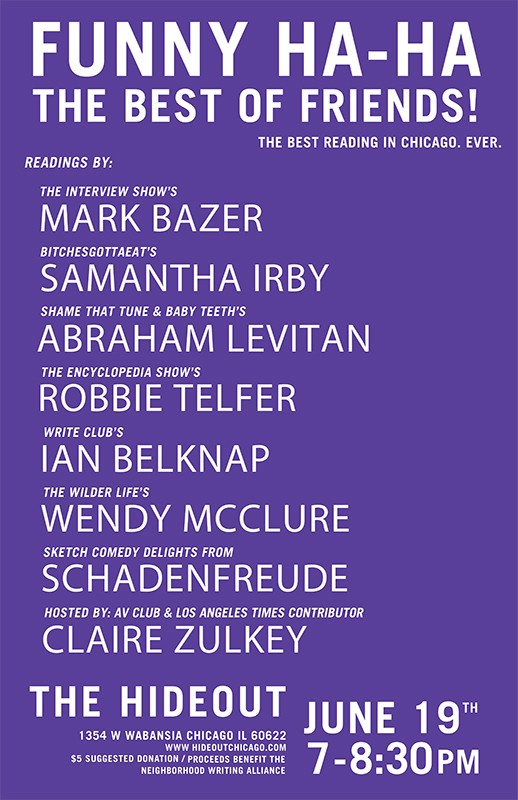 I will be making my debut at Story Club at Uncommon Ground in Wrigleyville this Thursday at 8 p.m. The goal of Story Club is to mix the spontaneity of an open mic with the experience of live theater, a forum for writers/performers to display their first person storytelling prowess, be it fiction or nonfiction, read from the page or memorized. The other featured readers includ essayist Julie Danis and Humor Me podcast producer Nellie Huggins, with Maggie Goodman telling a story on the audience-assigned topic: Hedonism. There will also be an open mic signup (four slots are available) beginning at 8:15 p.m. I will be leading a Young Adult fiction panel titled “Dark Days” at Printers Row this Saturday from 1 to 1:45 p.m. at The Mash stage, which is the voice of teen Chicago. I will be chatting with authors Veronica Roth, Aprillyne Pike, Elizabeth Norris and Bethany Griffin. I also want to throw a shout-out to the “Starting Fresh” panel that Saturday as well at 11:15, which I won’t be a part of but involves a lot of great writers: Stacey Ballis, Sara Pekkanen, Lauren Fox and Ann Bauer will be moderated by the lovely Mairead Case. Oh dear, what have I gotten myself into? I am participating in Karaoke Idol, starting at 8 p.m. at Beauty Bar. I will be singing terribly to help raise money for Read/Write Library and will be judged by a panel of my peers. This should be a mess. At 7 p.m. at the Book Cellar I will be reading something humorous with The Kates, the wonderful lady-comedy humor series. I will be up with Kristin Clifford, Alexandra Tsarpalas, Amy Sumpter, Maggie Graham, Natalie Kossar, Carrie Bain and the night will be hosted by the inimitable Kelsie Huff.